1. EFFECT OF THESE TERMS AND CONDITIONS OF SALE. The following terms and conditions shall apply to all quotations, order acknowledgements and other documents, dealings and transactions relating to the sale of goods manufactured. Coi shall not be deemed to have waived any of these terms and conditions, even if Coi fails to object to any contrary or inconsistent provisions appearing on, attached to, or incorporated by reference in any purchase order to other document issued by Buyer. Coi’s acceptance of any such purchase order or other document of Buyer shall be conditioned upon the understanding that these terms and conditions shall control, notwithstanding any such contrary or inconsistent term or condition of Buyer unless otherwise agreed to in writing. 2. QUOTED TERMS. All quoted terms are subject to correction for clerical error, and may be modified or withdrawn by Coi, with or without notice, at any time. Quoted prices are for continuous runs in the quantities specified, and assume that all tooling to be provided by Buyer shall be suitable for Coi’s operations. Coi’s delivery of up to 10%or under quantities quoted shall constitute fulfillment of the order unless otherwise agreed to in writing. 3. BUYERS MOLDS AND INSERTS. Buyers shall furnish any required inserts, F.O.B. Coi’s facility, in quantities exceeding order requirements by not less than 10%. 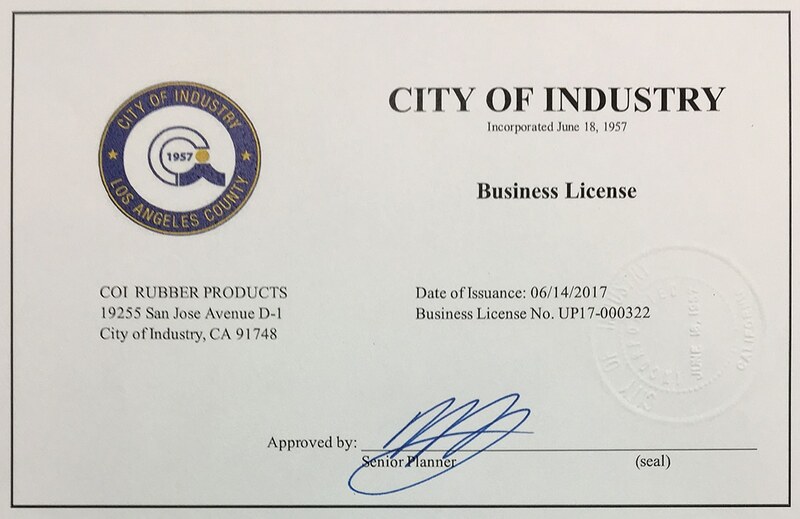 To the full extent permitted by law, Buyer hereby releases Coi from any liability for any loss or damage to molds, inserts or other materials furnished by Buyer. 4. PRICES. Unless otherwise agreed upon in writing by Coi, all prices, payments and references thereto shall be in U.S. Dollars. Unit prices do not include sales taxes, use or excise taxes, import or export duties, value added taxes, special licenses or permits, insurance, product orientation expenses, or similar charges. 5. PAYMENT. All orders are subject to the approval of Coi’s Credit Department. If Coi deems Buyer’s financial condition or payment practices to be unsatisfactory, cash payment or other security may be required. If Buyer fails to meet such requirements, Coi may discontinue the production and delivery of goods to Buyer and treat such failure at any time thereafter as reasonable grounds for the lawful termination of any pending order. Coi shall have the right to issue invoices o Buyer upon readiness of goods for shipment. Unless otherwise agreed upon in writing by Coi, invoices shall be due and payable NET 30 DAYS following date of invoice without regard to delays of transportation or inspection. Interest shall accrue on any overdue payment at the rate of 1.5% per month, or at the maximum lawful rate of interest, whichever is less. 6. TITLE AND RISK OF LOSS. Title of goods and risk of loss shall pass to Buyer upon notice to Buyer of readiness of goods for shipment. Freight and shipping obligations shall have no bearing on transfer of title or risk of loss. Claims for damages or shortages attributed to Coi must be filed with Coi within 10 days following receipt of goods or notice of loss, whichever occurs first, and must be accompanied by Coi’s packing slip and a detailed description of the claim. 7. SECURITY INTEREST. Buyer hereby grants Coi, and Coi shall retain, a security interest in all goods shipped or delivered to Buyer until payment of the total purchase price is received. At the request of Coi, Buyer shall execute and deliver to Coi any instruments Coi may deem necessary to protect Coi’s security interest in the goods. Coi shall have the right to file UCC financing statements and to take other appropriate actions to perfect its security interest in the goods. 8. LIMITED WARRANTY. Except as otherwise specifically set forth herin, Coi warrants only that the goods furnished by Coi shall conform to specifications regarding material and size set forth on Coi’s quotation and order acknowledgement. This limited warranty shall be in effect during a period of 90 days following the date of the shipment of the goods. 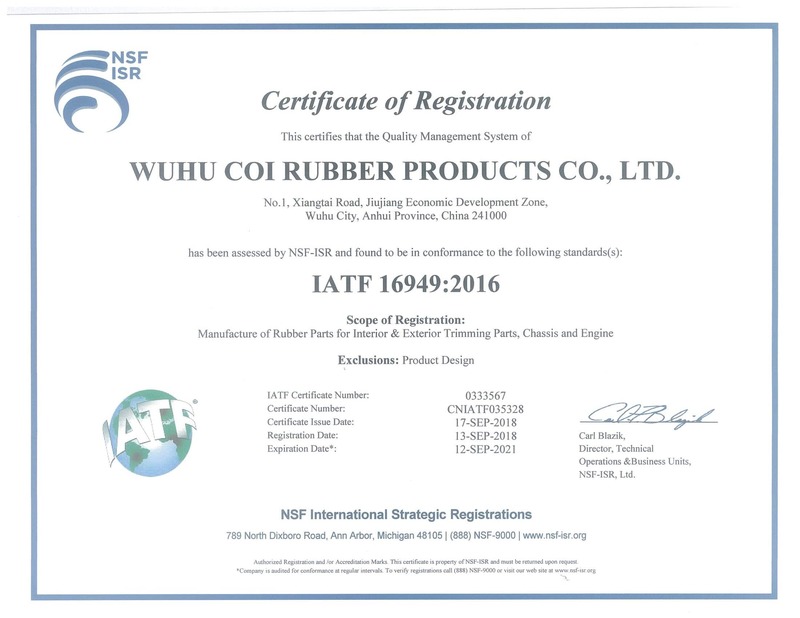 To obtain consideration under this limited warranty, Buyer must first send written notice to Coi, stating in what respects the goods are believed by Buyer to be nonconforming. Failure to given written notice within the warranty period shall be a waiver of this limited warranty and no assistance or other action thereafter taken by Coi shall be deemed to extend or revive the warranty period. Any goods believed by Buyer to be nonconforming shall be returned by Buyer to Coi’s facility, transportation prepaid, for examination by Coi. No goods shall be returned to Coi unless Buyer first obtains a return authorization (RA#) from Coi. If, in Coi’s reasonable judgement, the goods returned by Buyer are nonconforming and covered under this limited warranty, Coi shall have the option of (i) repairing or replacing such goods or (ii) canceling the order or portion thereof applicable to the nonconforming goods and issuing a credit to Buyer for the specified purchase price thereof, provided, in each case, that the nonconforming goods are returned to Coi’s facility. This limited warranty shall not apply to products which, in Coi’s reasonable judgement, have been the subject of negligence, misuse, abuse, accident, misapplication, tampering or alteration; nor shall it apply to products damaged by acts of God, war terrorism, or civil insurrection, improper installation, operation, maintenance or storage, or other than normal application, use or service including without limitation, failures caused by foreign materials, corrosion, erosion, or wear and tear. This limited warranty shall not cover, and Coi shall not under any circumstances be liable for, damages for injuries to persons or property; claims of third parties; loss of product; loss of revenues or profits; loss of use; expenses of labor, travel or other items relating to the removal or replacement of nonconforming goods; damages resulting from the removal of nonconforming goods or the installation of repaired or replacement goods; expenses relating to the transportation of goods to and from Coi’s facility; any consequential, incidental, contingent or special damages, whether arising in contract, in tort or under statue; or any other damages or expenses not agreed upon in writing by Coi, even if Coi has been advised of the potential for any such damages or expenses. In no event shall Coi’s total liability exceed the specified purchase price of the subject goods. THIS LIMITED WARRANTY IS IN LIEU OF ALL WARRANTIES, EXPRESS OR IMPLIED, INCLUDING, WITHOUT LIMITATION, ALL WARRANTIES OF MERCHANTABILITY AND FITNESS FOR A PARTICULAR PURPOSE OR USE. No person is authorized to give any other warranty or to assume any other liability on Coi’s behalf. 9. FORCE MAJEURE. In no event shall Coi be liable for any non-performance, delay in performance, or any other variation from Coi’s performance obligations, nor for any loss or damage to any goods supplied to Buyer, when occasioned directly or indirectly by any cause beyond the reasonable control of Coi or its suppliers, vendors, subcontractors, or other representatives or agents, including, but not limited to, communication line failures; power failures; natural disasters or act of God; acts of terrorists, criminals or a public enemy; war; riot; official or unofficial acts; contacts, regulations or restrictions of any foreign or domestic governmental agency; acts of Buyer or its employees, contractors, customers or agents; strikes or labor difficulties; or failures, shortages or delays in Coi’s usual sources of labor or materials. Coi shall automatically be entitled to a reasonable extension of all periods of performance when delayed by any such cause. 10. MODIFICATION, SUSPENSION OR CANCELLATION OF ORDERS. Requests by Buyer for any modification, suspension or cancellation of all or any part of any order, including, but not limited to, any change in specifications, quantities or delivery obligations, shall be subject to Coi’s written acceptance, and may result in adjustments to prices and delivery schedules or cancellation penalties which Coi, in its reasonable judgment, deems appropriate. Unless otherwise agreed upon in writing by Coi, Coi shall have the right to invoice Buyer for all goods covered by a blanket order not shipped within the agreed upon time period based on Coi’s quotation or order acknowledgement. 11. INDEPENDENT CONTRACTOR. At all times Coi shall bee deemed an independent contractor of Buyer, and not Buyer’s partner, employee or agent. 12. REGULATORY COMPLIANCE. Buyer shall comply with all applicable laws, regulations and rules governing good furnished by Coi, including, but not limited to, safety and health standards, environmental regulations, technical standards, and export controls. 13. LEGAL PROCEEDINGS. Buyer hereby irrevocably agrees that all legal proceedings arising from or relating to any goods furnished by Coi to Buyer shall be litigated only in courts within Los Angeles, CA. Buyer hereby consents and submits to the jurisdiction of any state or federal court located within Los Angeles, CA, and waives any right Buyer may have to transfer or change the venue of any such legal proceeding. Buyer hereby also irrevocable waives any right to trial by jury in any such legal proceeding. The prevailing party shall be entitle to the reimbursement by the other party of all court costs and reasonable attorneys’ fees incurred by the prevailing party in any such litigation. 14. INTERPRETATION. These terms and conditions shall be interpreted and enforced in accordance with the laws of the State of California, including the California Uniform Commercial Code (UCC), without giving effect to principles of conflict of laws. Whenever any conflict exists between these terms and conditions and any provision of such Uniform Commercial Code, these terms and conditions shall govern. The section headings contained herein have been inserted for convenience only, and shall not be considered in interpreting any term or conditions hereof. If any term or conditions contained herein is found by a court of competent jurisdiction to be invalid or unenforceable, it shall be deemed stricken here from without effecting the remaining terms or conditions hereof. 15. NOTICES. All notices and other communications required hereunder shall be in writing and delivered by telex, facsimile, telegram, or certified or registered mail, postage prepaid, return receipt requested. Any such notice shall be deemed to have been given on the date it is received during regular office hours at the address listed on the applicable order or at such other address as the effected party may have previously designated for notices.